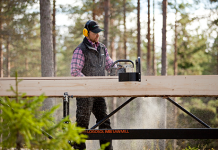 What is the best way to learn how to use a Logosol Sawmill? 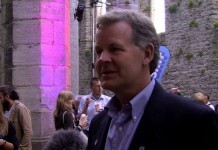 “You watch Logosol’s films and start sawing,” is Kjell Rogström’s answer. He lives in the village Larsarvet just outside Falun in Sweden. Kjell grew up on the family farm in Larsarvet, studied to be an engineer at the university of Lund, and then moved to Arboga, where he later started his own business within the field of electronics development. In 2005 he winded up the business. A couple of years earlier, he had moved back to his family farm and decided on de-escalating the hectic life as a small entrepreneur. But sitting still doing nothing was not an option. The farm included a couple of acres of woodland, just enough to heat the house with firewood and produce timber for household requirements. Formerly, there was a sawmill in the village, but it was closed down. Due to this, he ordered films about sawing from Logosol, the same films that today are available at www.logosol.se. 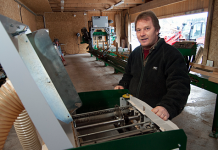 In 2006 Kjell bought a Logosol Sawmill with electric saw head and the friction feeder E37. One of the first projects was to build a roof over the sawmill, and after that a sturdy log table, on ground that earlier had been a potato and vegetable field. “Kjell is a real handyman,” his live-apart partner Zara Rogström states. He has cut a whole lot of renovation timber through the years, but now a big building project is in the pipeline. On the log table lie some 60 pine logs. The timber is going to become a new deck, an outhouse and some other odds and ends. 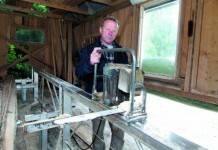 According to Kjell, the sawing generates double benefit. Beside construction timber, the sawmill delivers slabs that heat the house. The slabs dry quickly, are easy to cut into length and burn well. 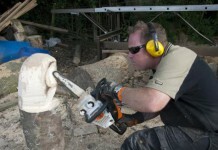 It was a novice who started to cut timber in 2006. The timber that now lies stacked for drying is of the highest quality. It is from dense pine with a lot of heartwood. 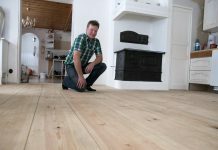 The surface is finer and the measurements are more accurate than what you usually find in a commercial timber yard. “If you only are careful, the deviation is at most one millimetre on a four metre long board,” says Kjell. Fresh Cut visited Larsarvet in early February. 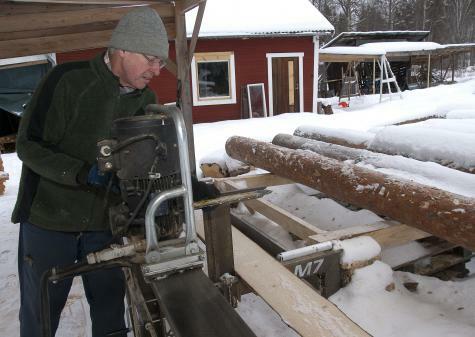 Kjell had already begun sawing the trees felled this winter, so that the timber will have enough time to dry for being used during the summer. This year it is particularly important that the sawing is ready in time. The house is to be extended so that his partner Zara can move in.